The intersection of tech, design, and business is often a scary and messy place. Massive walls of mistrust rise between the three — often from a lack of understanding of the ‘other’s’ role and what they bring. Further, the rapid pace of technical development has not helped. I have witnessed, multiple times, how grotesque and fractious the interaction between the three roles can become if there is a divide between them, and how quickly the process of creation crumbles and the finger pointing starts. But, I have been blessed enough to have been educated, trained, and to have worked extensively at the intersection of all three. I’ve built and delivered time and again products that work, make an impact, and solve a painful need. I learned the great value of small incremental changes that occur through the process of iterative collaboration between tech, design, and business — all focused on our users. How you get all three to work together is important. Despite some painful failures, I became an early adopter of the Agile manifesto. I learned the great value of small incremental changes that occur through the process of iterative collaboration between tech, design, and business — all focused on our users. Whenever I think about this process, the tune of “three blind mice” always plays in my head, reminding me of the truly blind and bumbling process of creation and innovation. In the end, with tiny small steps coupled with intense and open feedback, the three blind mice can go places. With the three mice chasing around in my head, I have been helping build startups ever since I stumbled into co-founding one during the dot-com crash; when the world of tech collapsed around our heads. After a couple more startups (some successful and some colossal failures), with a two-year interlude as a strategy consultant, I find myself feeling that I have been too long at the startup. Yes, I have been lucky enough to have done it a couple of times, but it was time for a different challenge, that of the scale-up, the rocket ship. And so, after two decades (gulp!) of commercial work, after tons of learning and failures and deep, deep scars of lessons well learned, I find myself looking for a fresh challenge that will push me to the very limits of my skills and comfort. I tried to think of the value I could bring, and it came down to this — well-earned lessons in scaling up diverse teams. Teams that solve painful problems faced by users through great design and solid tech delivery, all incrementally built. But my famous luck struck and struck hard. In my search, I stumbled upon TribalScale, and they are doing all that I wanted. And they had an opening! That meant I had to find a company that is igniting its next stage of growth. A company with a huge vision and a hunger to scale up. A company where I can contribute heavily to that growth and help that rocket reach escape velocity. A tech company at heart that is nimble enough to know when to apply what tech and more importantly, when not to. A company that champions good design philosophy focused on its users, humble enough to know when to change. A company that has deeply ingrained in its culture a desire to always push itself, and to be and execute better — hungry, never comfortable and willing to fail fast to learn even faster. A company that wanted to go global and solve big problems. Yes, I had my bar set quite high, but I knew that I would not compromise on this; otherwise, what’s the point? Knowing my extreme wish list, I had consigned myself to a drawn-out and wearisome search. Perhaps even the possibility of telling my wife that it was time for me to leave Toronto (again!). But my famous luck struck and struck hard. In my search, I stumbled upon TribalScale, and they are doing all that I wanted. And they had an opening! They needed a person who could step up and help grow their team to deliver all the cool goodies. I couldn’t believe the job profile as I read it, it spoke my name at every requirement; I had to find a way in. I did. I found my way in. I still pinch myself sometimes in the morning. Having this chance to help teams grow into monsters of agile delivery teams, teams that transfer great knowledge, know-how and value to clients and users. 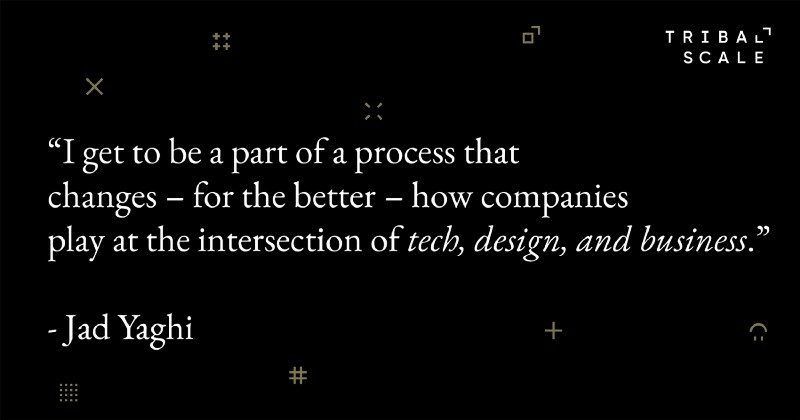 And I get to be a part of a process that changes — for the better — how companies play at the intersection of tech, design, and business. Demolishing their divisions. Pinching myself even harder. All the failures of the past have been worth it. I belong. I have found my tribe. Jad Yaghi is skilled at two things: First is his ability to fail fast and hard — and move on. This has allowed him to prototype, experiment and iterate his way to solutions to some very painful problems. Second, he knows what it takes to build large, effective, agile and lean delivery teams. He’s got a long record of finding and retaining the right people; transforming them from individuals into teams. Through the combination of these two skills, he has been able to create several tech startups. Such as Verold, enabling faster and cheaper 3D game development. Or ProjectBeagle, automating many of the backend and mid office processes in the tourism sector. And DigitalAIR, an augmented reality publishing platform. 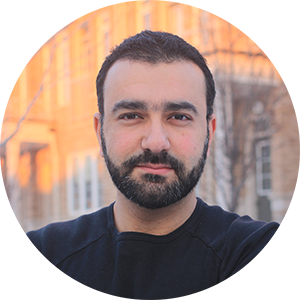 Jad is joining TribalScale as the Vice President of Delivery. In his spare time, Jad enjoys swimming alongside giant mantas and sharks while weaving through underwater coral gardens. Join our fast growing team and connect with us on Twitter, LinkedIn, Instagram & Facebook! Learn more about us on our website.